In honor of National Volunteer Month, we’re featuring the favorite spring recipe of Nate, our Manager of Volunteer Services. Nate’s role is to ensure our amazing volunteers have a meaningful and productive time in our kitchen. Prior to being Manager of Volunteer Services, Nate was our Bilingual Client Services Coordinator. Outside of Community Servings, Nate loves to cook and taste-test new foods. 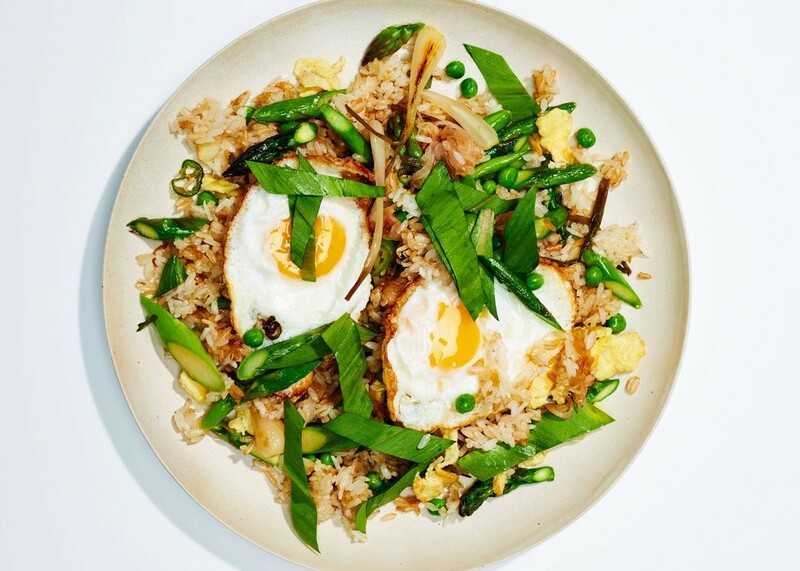 This vegetarian fried rice has the building blocks of a balanced meal (grains, vegetables, and protein) plus lots of fresh flavor. Substitute any veggies or protein you like. Recipe by Chris Morocco, Bon Appetit. Cut ramp bulbs in half and slice greens into 1″ pieces. Heat 2 Tbsp. oil in a large nonstick skillet over medium-high. Cook ramp bulbs, shallot, chile, and ginger, stirring occasionally, until fragrant and just softened, about 2 minutes. Add beaten egg and stir to break up; cook just until set, a matter of seconds. Add rice; toss everything together, then let cook without disturbing until rice begins to crisp, about 1 minute. Add asparagus, peas, and three-quarters of ramp greens and toss, breaking up rice as needed. Cook until vegetables are softened, about 4 minutes. Add soy sauce and toss to coat. Give it a taste; you may want to add a little more soy sauce. Divide fried rice among plates. Top each with a fried egg and shower with remaining ramp greens.